Jamie Oliver says of Pride and Pudding ‘A truly wonderful thing of beauty, a very tasty masterpiece!’ BLESSED BE HE THAT INVENTED PUDDING The great British pudding, versatile and wonderful in all its guises, has been a source of nourishment and delight since the days of the Roman occupation, and probably even before then. By faithfully recreating recipes from historical cookery texts and updating them for today’s kitchens and ingredients, Regula Ysewijn has revived over 80 beautiful puddings for the modern home cook. There are ancient savoury dishes such as the Scottish haggis or humble beef pudding, traditional sweet and savoury pies, pastries, jellies, ices, flummeries, junkets, jam roly-poly and, of course, the iconic Christmas pudding. 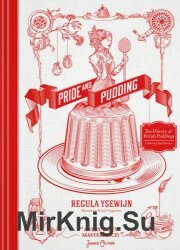 Regula tells the story of each one, sharing the original recipe alongside her own version, while paying homage to the cooks, writers and moments in history that helped shape them.